So the Spaghetti Warehouse. It’s a chain. It’s seriously a warehouse. The space is ginormous, with super high ceilings, and space beyond reason. We did sit in the trolley car though. Yes, the place is so big it can fit a trolley car. And then some. You get some complimentary freshly baked sourdough bread. So ok, the bread is not bad. And it comes with an herby butter. Nothing bad about any of this. In order to withstand this experience, we did need some serious liquid action. I had an amazing strawberry daiquiri. I downed this way too fast. The Turin Trio. Obviously not something that one normal human could eat. They are of the gigantic portion world here. It’s a huge heap of their 15-layer lasagna, fettuccini alfredo, and chicken parm. It’s seriously a lot of food. Even the priest-to-be could not muster the powers above to put much of a dent in this thing. The other priest-to-be just got the 15-layer lasagna. Yeah, that’s one entree. It’s enough for an entire seminary, don’t you think? He tried, but he had plenty to take home. J got the chicken marsala. While the chicken itself seemed to be cooked just fine, the sauce was just way too thick and sweet. Perhaps this came out of a can or a jar? It just didn’t seem typical of chicken marsala. I’ve seen chicken marsala dozens of times, and it’s never been like this. As for me, I wasn’t hungry at all. But I felt like food had to be ordered. So I got the soup and salad. The salad was fine, but the dressing was just too much. It was italian and just drowning my iceberg (which I actually like) and obviously out of a generic bottle. 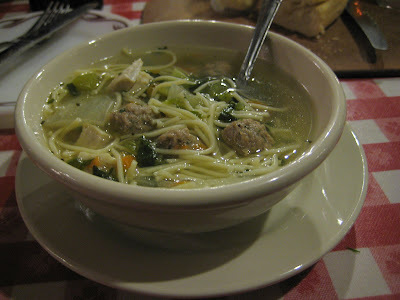 The soup choices were italian wedding and minestrone. 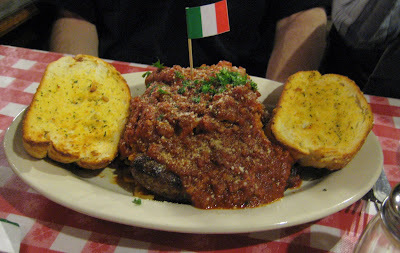 I asked the waitress which was better and she said italian wedding. Ugh. This soup was so beyond bland it was nuts. Ok, so the little sausage balls, or whatever those balls were, they actually had flavor and were somewhat tasty. But the rest of the soup, or the 98% remaining, was bland beyond all get out. It’s shocking that they can pass this slop off as soup. In addition to my strawberry daiquiri and some beers, we ended up having a couple of Sidecars. The waitress and the bartender didn’t really know what they were, and in reality, neither did any of us. But with the trusty aid of the interwebs, we had the bartender whip up some cognac based Sidecars. 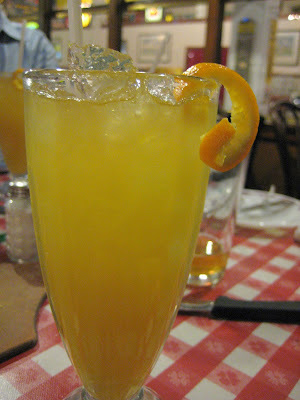 The priest-to-be who wanted the Sidecars in the first place, said this was a man’s drink. And then when we got them, they were served in these girly glasses. So perhaps its man-ness needs to be reconsidered. But damn, this was a fine drink. And at the Spaghetti Warehouse no less. The service was good. Our waitress was friendly and she appreciated that we weren’t using a coupon. We’re probably not the typical crowd here, so she seemed to enjoy us. There is a high percentage of coupon using clientele here. 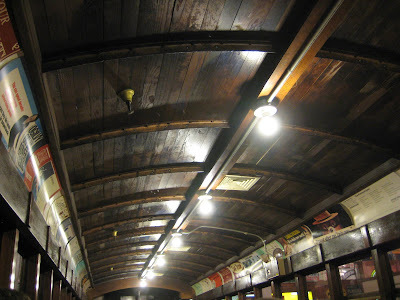 Sitting in the trolley car was pretty cool though. We also saw a little old lady fall over while we were eating. She caused quite the commotion, but ended up being ok. 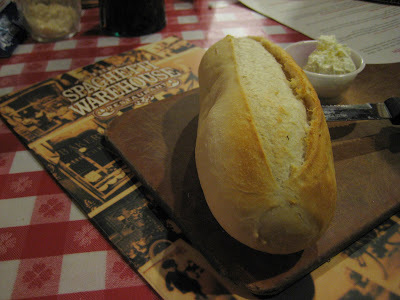 I still can’t believe I ate at the Spaghetti Warehouse. Sure, you get tons of food for the price (and who can knock value these days), but I’m going to go back to avoiding this place again. Because it was what I expected! LOL! I can’t believe you ate at the Spaghetti Warehouse!! Bless your heart, as they say in the South. V and I always joked about going here. 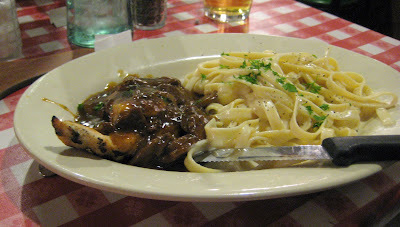 Our favorite resto for disgustingly portioned Italian fare was Maggiano’s.